Bruce is a freshman, who entered the college months ago. Since his college life kicked off, he led a life completely different from that in middle school. The college is rather large. It will him a quarter minutes to walk from his dormitory to the teaching building. He intended to buy a bicycle as personal transport for commute between the dormitory and classroom. But he was concerned that the bicycle was subject to theft when it was parked out of his sight. 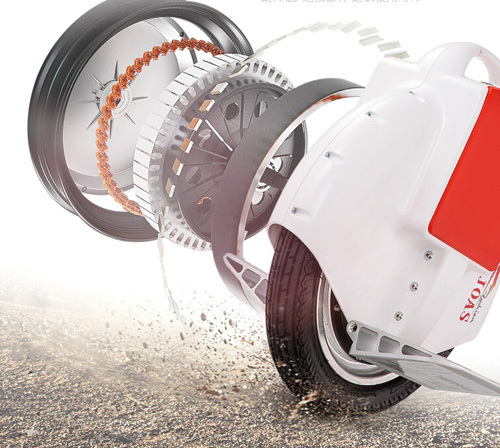 Someday, his roommate recommended a novel scooter to him, that is FOSJOAS self-balancing one wheel electric scooter V6. He considers it as workable and jumped at it online. Now Bruce rode FOSJOAS V6 for commute between his dormitory and classroom. It is no longer his biggest bugbear to be late for class. He had to walk 15 minute from his dormitory to the classroom, whereas he merely spend five minutes to his classroom. FOSJOAS single-wheeled intelligent scooter V6 is small in size so that he can carry it into his classroom. He puts it nearly his feet in class without care about theft. Sometimes he rides V6 to hang out around the college. FOSJOAS V6 saves Bruce a lot of time. Surely enough, it is far better than the bicycle. Accordingly, he is grateful to his roommate for recommendation. More often than not, the ride of FOSJOAS V6 allures other college students. They are not only impressed by its convenience but also surprised by the wheelie of Bruce. Bruce can expertly master and steer FOSJOAS V6, which does not mean that it is easy to learn. Bruce spent much time on practice on ride of FOSJOAS electric one-wheel scooter V6. After all, practice makes perfect. Two-week practice hones the skill of riding. That is why Bruce can smoothly ride it to classroom. Therefore, the friends around him admires his wheelie very much. Bruce comes under the spotlight.